In the words of Gurdjieff people cannot perceive reality in their current state because they do not possess consciousness but rather live in a state of a hypnotic “waking sleep”. “Man lives his life in sleep, and in sleep he dies.” As a result of this condition each person perceives things from a completely subjective perspective. Gurdjieff stated that maleficent events such as wars and so on could not possibly take place if people were more awake. He asserted that people in their typical state function as unconscious automatons, but that one can “wake up” and become a different sort of human being altogether. (Source: George Gurdjieff – Wikipedia, the free encyclopedia. Automatons are dangerous. Do people notice which way they take for morning walk every day? which way they take every day? Which seat they sit upon? Day after day, week after week, I see people getting up at same time, walking same path, sitting on same bench! Another fat/bulky gentleman was walking ahead of me. Right in the middle of path. There was no way that I could cross him without touching. But he was lost in thought. Completely oblivious of my presence or foot steps. Similar in bar rooms. Every day looks the same. Worse the same palvar as well. As if same movie played all over again. Another automaton works as domestic help. 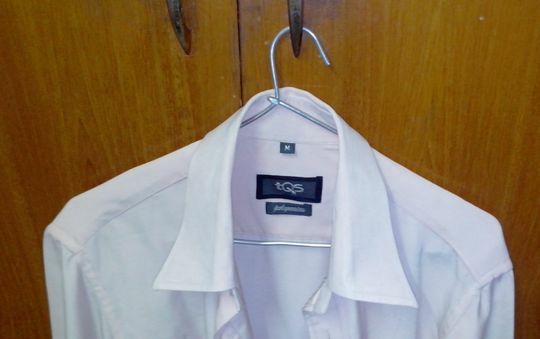 For years he presses clothes and hangs them with hanger opening towards the right. (See pic. below) It means I can hang it on the left side of cupboard. It would have been a good idea if I was a left-hander but I am not. Nor is cupboard. This entry was posted in Life and tagged Automaton, Fourth Way, George Gurdjieff, Philosophy, Religion and Spirituality. Bookmark the permalink.